I start at Brookvale Bridge in Witton, which is a pretty random place to begin, then follow the towpath of the Tame Valley Canal. A lad in shorts tugging a Staffie walks ahead, while a mixed race couple hand in hand dawdle behind. 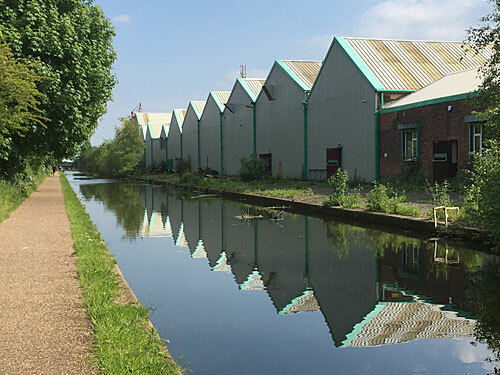 The canal is straight and quiet, bar some gossiping workmen out the back of a row of rippling warehouses, who yell across something in Brummie which is either a cheery greeting or a mocking jibe, it's hard to be sure. Eventually the shadowing M6 swings in from the left on lofty pillars, first a slip road A38(M)→M6(west), then another A38→M6(west), then another A38(M)→M6(east), then another A38→M6(east). 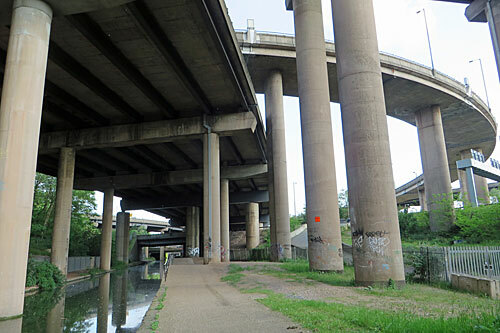 This can only be Spaghetti Junction, a 1970s megastructure squeezed into the nomansland above a canal junction and shielding it from sight. 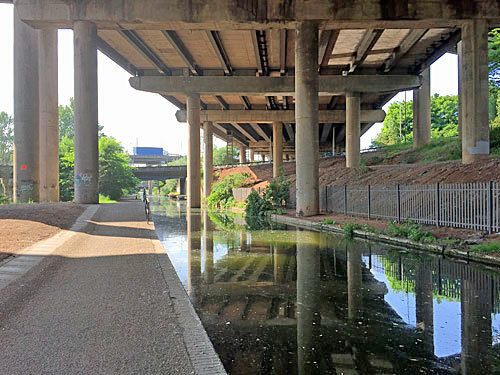 I've blogged about my first visit here previously, but the sudden transformation from leafy canal to concrete underworld never fails to amaze. Traffic speeds high overhead on various interlocking carriageways. 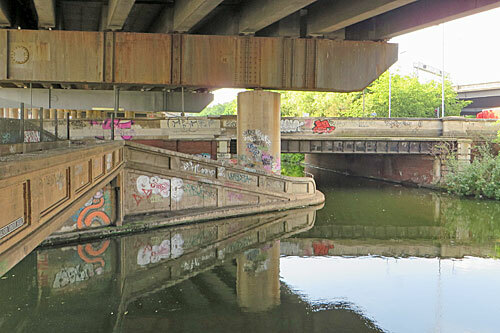 The most impressive are the sharply curved swirls, these seemingly the tallest, while others swoop above the towpath on layered trajectories atop graffitied columns. The canal continues straight ahead, because it was here long before the internal combustion engine was invented, at one point ducking into semi-darkness beneath the M6 proper. At Salford Junction three canals meet, one of these the Grand Union, and a fingerpost points the way to distant towns. 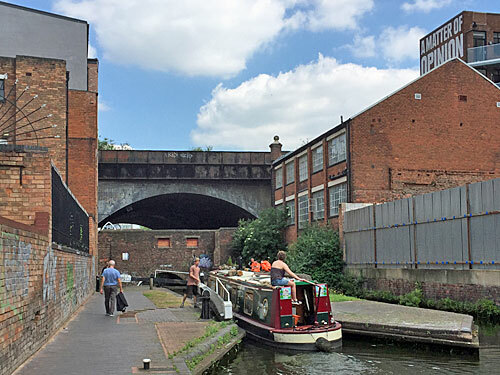 I turn south along the Birmingham and Fazeley, the waterway threaded through long-standing industrial hinterland, its banks not yet succumbed to residential transformation. The most popular means of transport here is evidently the bicycle, from laughing lads to sweaty homebound commuters tinging their bells and nipping over cobbled humps. 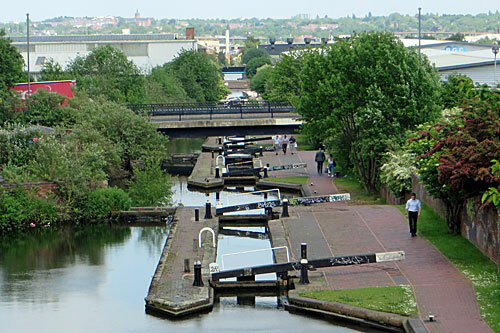 The eleven Aston Locks nudge closer together as they rise inexorably past the gasholders towards Aston Junction. Replace the urban backdrop and overpasses with green fields and lanes and this multi-gated climb could easily be some rural idyll. 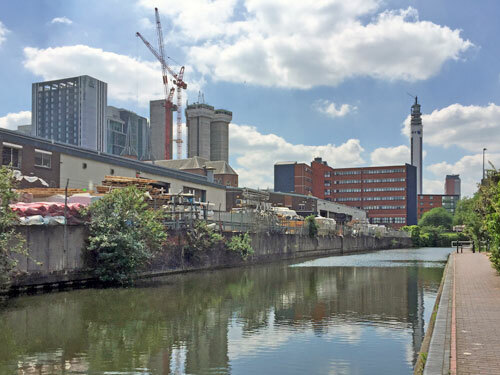 I eschew the Digbeth branch for a beeline to the city centre, the canal now broader as it rounds the University, and somewhat busier too. Beyond the waterside warehouses twin liftshafts rise, the roof of St Chad's Cathedral still managing to poke above the scene, for now. Birmingham's BT Tower is not as iconic as London's, but stands out more clearly amid a skyline still more open than the capital's. Further ahead the canal darkens to duck beneath the platforms of Snow Hill station, and narrows between high brick walls, and weaves below the streets of the Jewellery Quarter. 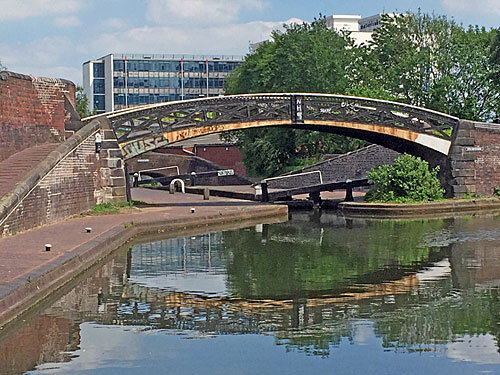 A group of mates on a narrowboat are drinking their way up the Farmer's Bridge flight, a tightly-packed ascent of thirteen locks in the heart of the city. Two open and shut the lower gates as one chugs their craft inside, while another dashes athletically up to the next gate to unlock the paddles and drain the water. Despite obvious keenness their progress is not fast, nor could it be, and I can stride past all thirteen locks in the time it takes them to do two or three. Old Turn Junction has a central island, a fair few footbridges and the golden roof of Birmingham Library bearing down. 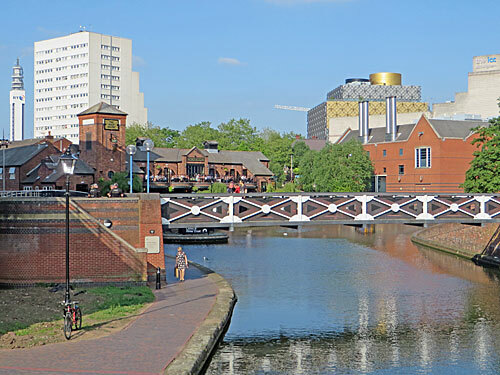 The former maltings are now a pub, and various popular food and retail developments now intrude, the towpath crowded with drinkers and shoppers all the way down to Gas Street Basin. Four armed police officers are standing on the walkway outside Ed's Easy Diner, passively defending the populace whilst having a nice chat in the sunshine. 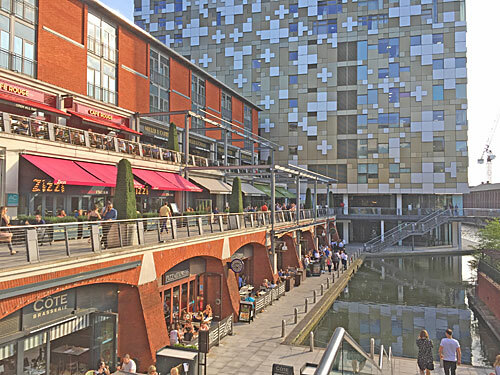 Peak commercialisation comes at the first bend on the Worcester and Birmingham Canal, where a former sorting office has been transformed into The Mailbox, a luxury mall with waterfront restaurant terraces. Smart couples and office pals sip wine while ordering steak or pasta, in the shadow of a weird geometric panelled building called The Cube, topped off with pointy owl-like ears. The contrast with the start of my walk is extreme, the canal the only constant.